Barns add color to the scenery. Mid-July, 2012 – When we left Mesa Falls, Idaho, and its glistening rainbow behind, we crossed into Montana to visit friends in the Bitterroot Valley. This is a valley rich with the spirit of another time and place, where ranching still plays an important role. Yet at the same time we heard rumors that some of the most astronomically rich, like the founder of Intel, own mammoth estates in the hillsides, giving the area a certain mystique. Cole and Bob get ready for work. Their neighbor Carl is a rancher, and he invited us to come over to his ranch to watch a small “cattle drive” as he and his ranch hands moved the herd from munching on grass in one field to dining on another. 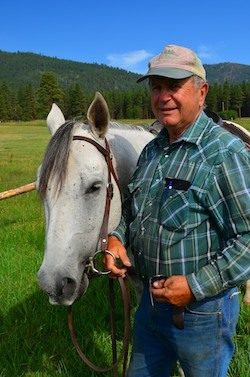 I had gotten caught up with computer work and missed the fun, but Mark enjoyed a fabulous morning among horse hooves and snorting cows as the ranchers rounded them all up. The cows are about to be moved. Do they know? Cole, Bob, Jack & Carl pose for pics! These cows are well loved and are more obedient than most, I imagine, and in no time the two dogs and four mounted ranchers had persuaded the stomping and mooing group to move on to greener pastures. 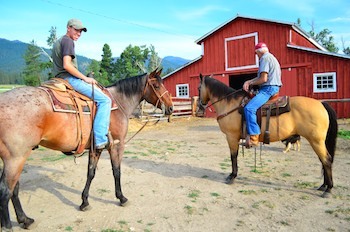 In these parts there is often a trade that goes on between ranching and non-ranching landowners. There’s a lot of value in having a herd of cows take care of your mowing, especially if you’ve got a lot of acres to mow. At the same time, the cost of feeding a large group of very large animals can be a bit steep. 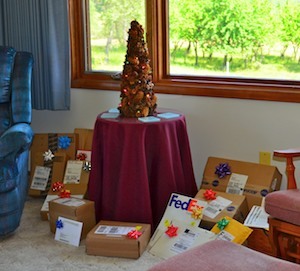 So just about the time that a herd of cows needs fresh greens — and just about the time that a non-rancher’s land is beginning to look a little overgrown — the two neighbors get together, shake hands on the trade, and the herd is moved. 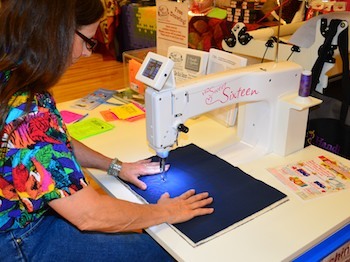 This is also an area where traditional crafts are treasured, and one morning I joined Donna Lea and her daughter Diana on a trip to the local quilting show. I love handcrafts, needlework and all things to do with fabric, thread and yarn, so this was a real treat for me. What a surprise it was to discover that quilting has gone high tech. The sewing machines were incredible: huge and computer driven with electronic displays where you can select stitches and sizes and everything else. The fabrics are out of this world as well with photographic quality images of everything from animals to mountains printed in all sorts of hues. The days of hand stitched geometric designs made of calico patterns are long gone. 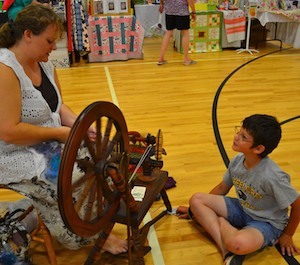 Fortunately the roots of needlework are still valued, and a woman sat at a spinning wheel in the center of the room explaining the old fashioned techniques to an audience of young kids that buzzed around her. Modern quilt designs are beautiful. Best of all, though, was the exhibition of quilts hanging in rows along one end of the hall. There were historic quilts with notes saying this like, “This quilt was owned by great-aunt Betty in 1927,” and there were traditional quilts made in the old style. 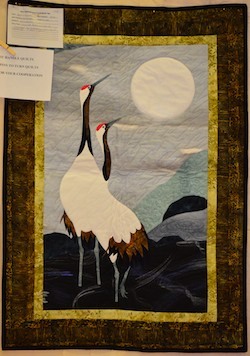 But my favorites were the modern ones that have unusual designs and motifs you would never expect in a hand-made quilt. The Bitterroot Valley charmed us for two weeks, and we soon discovered more fine craftsmanship in the town of Hamilton, Montana at BitterSweet Guitars. 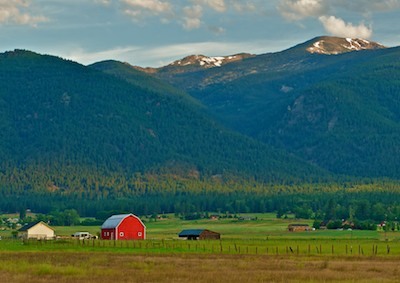 This entry was posted in Montana and tagged Montana, Montana Bitterroot Valley, Travel, USA, WP Travel by Roads Less Traveled. Bookmark the permalink.